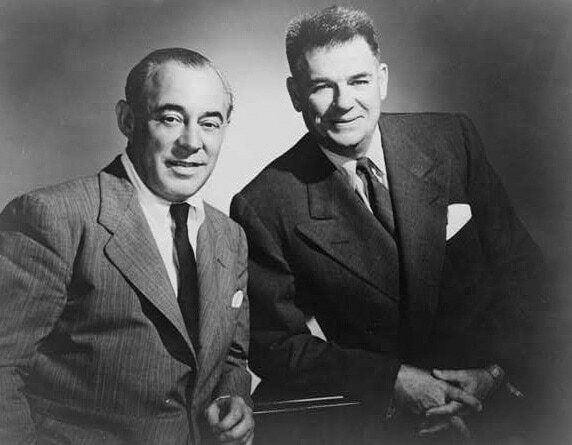 Rodgers and Hammerstein were the most legendary American musical songwriting duo of all time. This team consisted of the composer Richard Rodgers (1902-1979) and the author and lyricist Oscar Hammerstein II (1895-1960). They worked together on eleven historical musicals from 1943 until Hammerstein’s death in 1960, and produced musical theater’s greatest string of Musicals by any songwriting team in history, garnering thirty-four Tony Awards, fifteen Academy Awards, two Pulitzer Prizes, two Emmys, and two Grammys. The Pulitzer Prize winning author, Oscar Hammerstein II is considered one of the most important figures in the history of American musical theater, and was probably the best book writer in Broadway history. Hammerstein was a true "corny" American romantic humorist (n.b. - "I'm as corny as Kansas in August" - lyrics from "A Wonderful Guy", Oklahoma). By interspersing the important social issues of the day in his lyrics and bookwriting, he made the story, not the stars, central to the musical, and brought it to full maturity as an art form. Prior to Richard Rodgers, Hammerstein collaborated with composer Jerome Kern for many years until Kern's departure for Hollywood in 1934. With the writing of the 1927 musical Show Boat, Hammerstein and Kern are credited with inventing the form of American musicals known today. The Rodgers and Hammerstein collaboration started in the early 1940’s when Rodgers read Lynn Riggs' stage play Green Grow the Lilacs, and was interested in turning this into a musical. When Rodger's long-time collaborator Lorenz Hart declined to work on this, Rodgers called on his old friend Hammerstein who agreed to do the project, and the result became the legendary 1943 musical Oklahoma, which opened with the inspired Hammerstein lyrics: “There’s a bright golden haze on the meadow”. During their seventeen-year collaboration, Hammerstein would create a brilliant set of lyrics for a "perfect" spot in the play. He would then type them up and send a neatly finished copy to Rodgers who would proceed to write the "perfect" melody to those brilliant words. The duo completely re-worked the musical theatre genre by advancing musicals with thought-provoking plots, and making every aspect of the play: the dance, the song, and the drama, important to the plot. While Rodgers and Hammerstein's plays contain some of the happiest, cheerful, and most uplifting songs in American culture, ("Oh, What A Beautiful Mornin'", "People Will Say We're In Love", "If I Loved You", "June is Bustin' Out All Over", "It Might As Well Be Spring", "Some Enchanted Evening", "Hello Young Lovers", "Something Wonderful", "Climb Every Mountain", "The Sound of Music"), the higher purpose in many of their works addressed the important social issues of the day: racism (South Pacific), sexism (Oklahoma), classism (The King and I), domestic violence (Carousel) , fascism (The Sound of Music), and immigration (Flower Drum Song) to name a few. Many of their plays had love stories at their core and the obstacles the lovers must overcome, and most were made into award winning films producing 15 Academy Awards. Their musical Cinderella, was the first musical written and produced solely for television and produced the songs "Ten Minutes Ago" and "Do I Love You Because You're Beautiful". Upon Oscar Hammerstein’s death in 1960, shortly after the team completed The Sound of Music, all lights in the Broadway theater district were turned off for one minute in his honor. During the next twenty years, Richard Rodgers composed five more Broadway Musical scores, one using his own lyrics (No Strings, 1962), and four with lyrics by the Musical Theater giants Stephen Sondheim (Do I Hear a Waltz, 1965), Martin Charnin (Two by Two, 1970 and I Remember Mama, 1979), and Sheldon Harnick (Rex, 1976). Upon Richard Rodgers' death in 1979, all marquis lights in every theater on Broadway were turned off for one hour in his honor.